In the 1990s, commentators across the political spectrum observed the rise of civic British national identity in the UK. Both the Major and Blair governments promoted “active citizenship” and rolled out polices such as Citizenship Ceremonies for the naturalised and citizenship education in schools – with the civic republican philosopher Bernard Crick a significant influence over many of these reforms. From a very different angle, the Britpop moment and “cool Britannia” brand made the Union Jack fashionable. A confident multiculturalism and relaxed, mongrel Britishness was part of the zeitgeist. From the vantage point of 2014, that moment seems very distant. In the last decade, we have seen instead a resurgence of the infra-national identities of the UK’s constituent countries: the renaissance of Scottishness in Scotland, the rise of Welshness in Wales, and – much less reflected upon – the return of Englishness in England. The 2011 Census included a national identity question. It showed that, in England, Englishness is the predominant national identity, expressed by two thirds of the population (with 58% choosing only English identity), while just 29% identify with Britishness (19% choosing only British identity). For many, this kind of Englishness is probably expressed activities such as cheering on (or moaning at) English sporting teams. But we have also seen its political mobilisation: in resentment at Scottish power in Westminster, in the sinister street theatre of the English Defence League and its offshoots, and in the rise of UKIP. It is important, however, to note the geographical and generational dynamics of this resurgent Englishness. In analysis of the 2011 Census I have done with Sundas Ali (soon to be published by the Government Office for Science’s Foresight Future of Cities programme), we found a band of “English cities”: cities with over 75% English-only and over 80% English-plus-other identification. These include Barnsley, Doncaster, Grimsby, Mansfield, Middlesbrough, Southend, Stoke, Sunderland, Wakefield and Wigan – often ageing, post-industrial cities associated with the demographic Matthew Goodwin and Rob Ford identify as the “left behind”: older, whiter, less educated and more working class than the population as a whole. Although many pundits have noted the “working classness” of the left behind, age is actually the most distinctive feature of UKIP’s support base. As Rob Ford has shown in other work, one of the social changes they have been left behind by is a massive generational transformation in attitudes to race, mixing and migration, with younger generations significantly more comfortable with mixed, inclusive, civic identities. If we turn from the white majority, we can see that there are other sections of the population have embraced Britishness. As Lucinda Platt and others have shown, Britishness is especially common among migrants and minority ethnic populations – and in particular those from South Asian and/or Muslim groups – who are far more likely to identify as British than their white British neighbours are. The “British cities” in the 2011 Census (with English-only identities at around 20% and British-only identities close to 40%) are multicultural places with long-settled migrant background populations, often with larger South Asian and/or Muslim communities: Blackburn, Bradford, Leicester, London and Luton. Within London, boroughs with long-settled minorities – Brent, Tower Hamlets and Harrow – have particularly high British-only identification. And among this British minority, the most British of all seem to be new citizens. In a representative survey of the newly naturalised and failed naturalisation applicants (which I conducted with Dina Kiwan, Alessio Cangiano and Zoe Khor at the end of 2010), we found extremely high levels of national identification. 87% felt British, including 58% of respondents who felt British “a lot”, and only 10% felt “not very” or “not at all” British. A lower (though still significant) share of citizenship applicants (40%) felt English/Welsh/Scottish/Northern Irish “a lot”. There are several explanations for this. The migration studies literature consistently identifies mechanisms whereby the first generation invests emotionally in the receiving society, asking little of it and grateful for its hospitality (whereas the second generation, raised with the same aspirations as non-migrant peers, expects more and is consequently less satisfied). Clearly, too, those who apply for naturalisation may be motivated to enter the process partly because of their identification with their adopted home. But there is also some evidence for a policy success story for the institutions of civic Britishness developed in the Blair period. The majority of the naturalisation applicants we surveyed (successful or not) also believed that the act of applying for citizenship itself has helped them feel they belong in the UK and its nations, while only about 15% think that it was “not very” or “not at all” helpful. It is worth noting, however, that – as with resurgent Englishness among the “natives” – Britishness among the naturalised is subject to geographical dynamics. While rates of Britishness were high in both new and old “contact zones”, other variables were less evenly distributed. Although feeling a sense of belonging locally and having cross-ethnic social networks were both predictors of a strong sense of Britishness among the new citizens, these did not correlate with each other and were found in different places. In the “English cities”, the new citizens identifying as British (who had often arrived on work or study visas from countries such as the Philippines and Nigeria) told us more than half their friends were of other ethnicities (although we did not ask them how extensive or deep their social connections were) but had low place attachment. 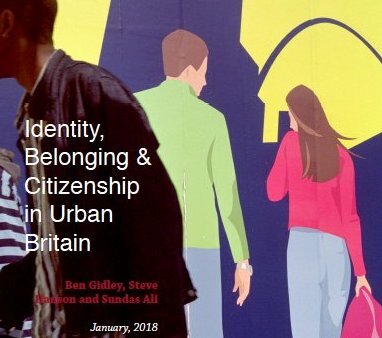 In the “British cities” in contrast, the new citizens identifying as British (often originally family migrants, from countries such as Bangladesh and Turkey) socialised within their own ethnic groups but had a strong sense of local belonging. These patterns raise questions about the relationship between citizenship, belonging and integration – at the very least suggesting there are multiple paths to integration rather than a one-size-fits-all approach. Geography, generation and other variables matter profoundly. I think these findings also suggest we should celebrate our integration success story rather than dwell on outdated and distorting ideas of migrants “failing to integrate”. If new migrants are feeling more British than ever, while older majority citizens are feeling less British, perhaps we need to reboot our integration debate entirely.